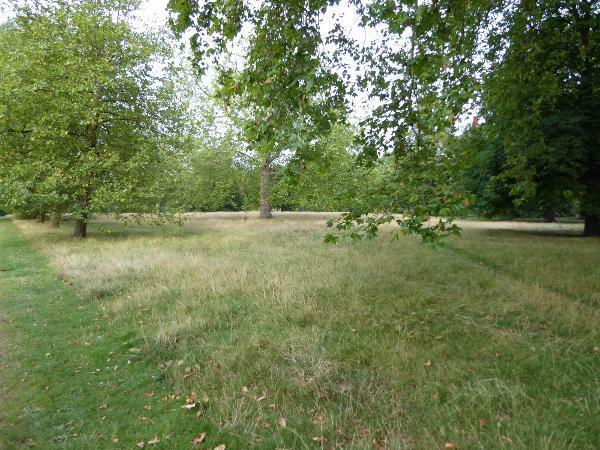 We're approaching the district from the north and so are crossing the Kensington Gardens. 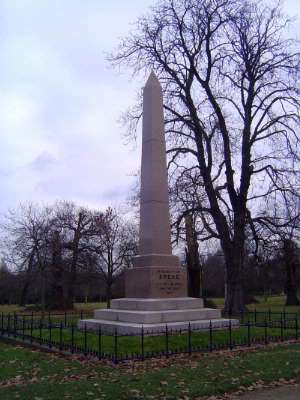 Nice obelisk. Any ideas? It reads: "In memory of Speke. Victoria Nyanza and the Nile 1864." That was the year Speke shot himself, presumably accidentally. Two years later, this stone went up. 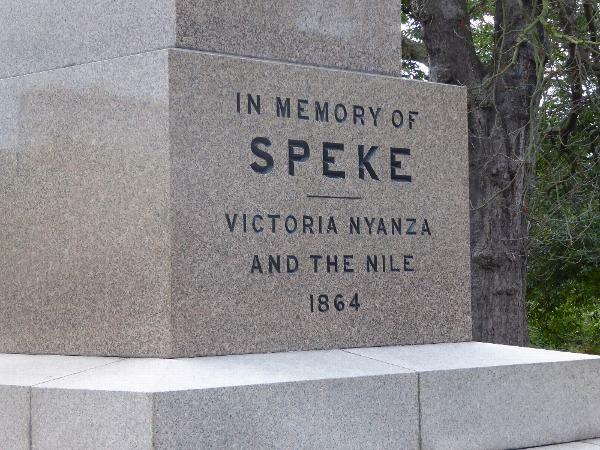 No need for Speke's Christian name; no need to explain the significance of Lake Victoria or the source of the Nile. Those who would appreciate the monument already knew. A less elegant monument stands at the place where the river leaves the lake. Forget five-star hotels: here's the place to stay in London, if your timing's right. 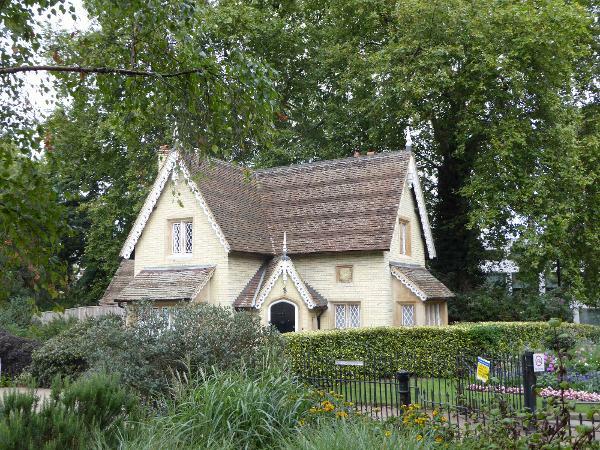 It's Buck Hill Lodge, also in the Kensington Gardens. Also in the Gardens, this is one of three castings of Physical Energy, by George Frederick Watts. Created in 1902, the figure in Watts' own words was "a symbol of that restless physical impulse to seek the still unachieved in the domain of material things." Another of the castings is at the Rhodes Memorial in Cape Town, and the third is said to survive on the grounds of the national archives in Harare, after being removed from its original position at the High Court building in Lusaka. 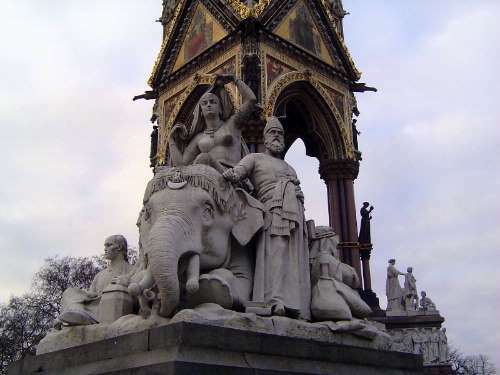 Is the statue a fair symbol of Britain at its imperial zenith? Here, perhaps, is a better or at least more conventional one. 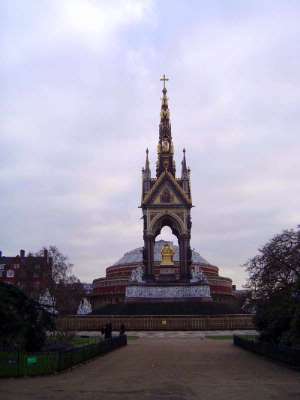 Pevsner writes: "This 'memorial of our Blameless prince' (Builder, 1863, p. 361) is the epitome in many ways of High Victorian ideals and High Victorian style, rich, solid, a little pompous, a little vulgar, but full of faith and self-confidence" (3:489). 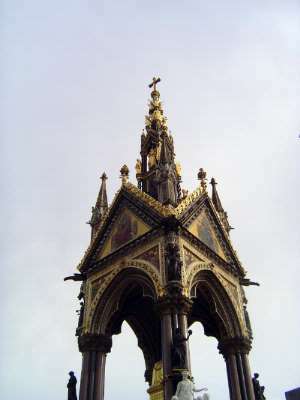 The designer was George Gilbert Scott, the Victorian master of the Gothic. 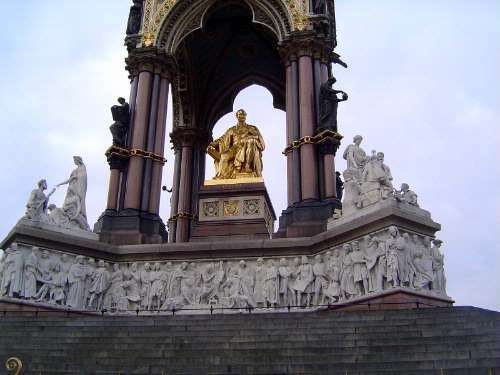 He stated that the Albert Memorial expressed his "highest and most enthusiastic efforts." (See Scott's Personal and Professional Recollections, p. 269.) Among his contemporaries, opinions varied. Pevsner quotes M.D. 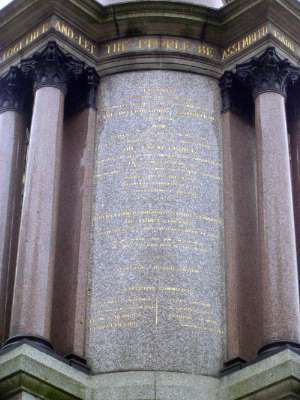 Conway writing in 1882 that the memorial is "beyond question the finest monumental structure in Europe." Another critic dismissed it as "an uncomfortable feat of engineering." Early proposals included a monolithic obelisk 150 feet high--the Washington Monument is over 500--but Scott wanted a monument that honored the prince's religious faith. "This I effected," he wrote, "by adding to its apex, as is believed to have been done by the Egyptians, a capping of metal, that capping assuming the form of a large and magnificent cross" (Recollections, p. 262). In addition, he wrote, the monument was "the realization in an actual edifice, of the architectural designs furnished by the metal-work shrines of the middle ages. Those exquisite productions of the goldsmith and the jeweller profess in nearly every instance to be models of architectural structures, yet no such structures exist, nor, so far as we know, ever did exist... They are architecture as elaborated by the mind and the hand of the jeweller; an exquisite phantasy realized only to the small scale of a model. My notion, whether good or bad, was for once to realize this jeweller's architecture in a structure of full size, and this has furnished the key-note of my design and of its execution" (p. 263-4). He added, "The greatest fault in the design, in my own opinion, is that the fléche is too high" (p. 268). 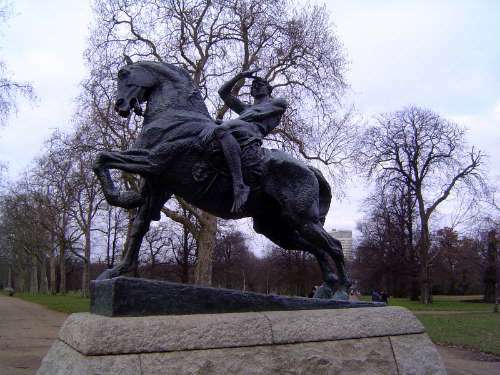 John Henry Foley was the sculptor of Prince Albert. 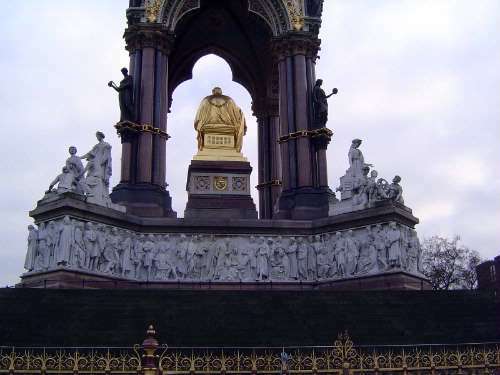 The statue for a time was painted black after pollution had destroyed the originally gilding. It has since been regilt. 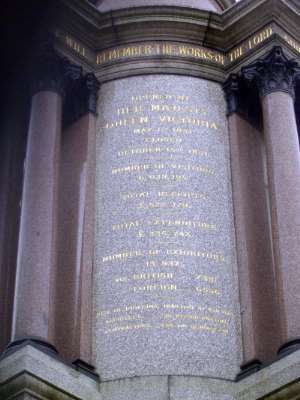 The frieze at the base is in itself a monument to Victorian faith in the existence of great men. It was, in Scott's words, "the very soul of the design" (p. 269). There are 169 figures here, neatly sorted into musicians on the south, painters on the east, sculptors on the west, and architects on the north. 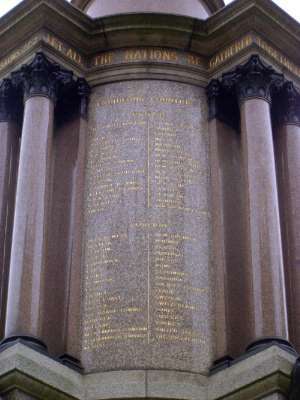 They're further grouped by nationality on the south and east (the sides done by Henry Hugh Armstead) but by chronology on the west and north (the sides done by John Birney Philip). The figures are named at the base, though an eagle eye is needed to read the labels. Armstead and Philip bid low on the project. 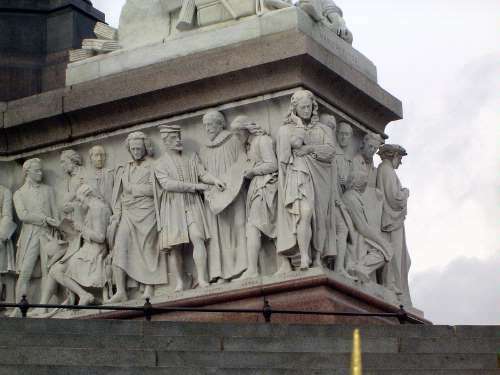 Scott wrote, "Being men of less established fame than the older sculptors, they undertook the work at a far lower price that these would have done, and, as it proved, to their own cost." 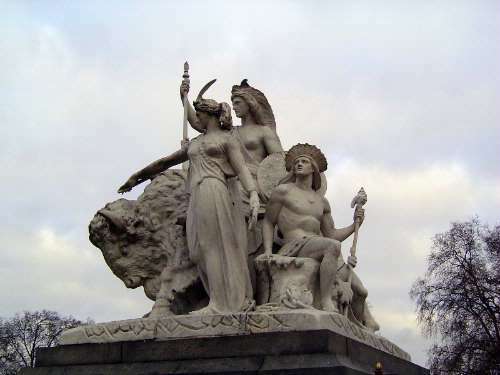 The larger figures above the frieze personify Commerce (on the left, by T. Thorneycroft), and Engineering (on the right, by J. Lawlor). Below: a passel of architects. 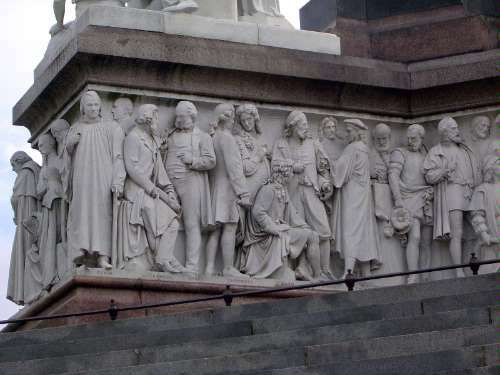 The figures are generally difficult to identify, though the architect Augustus Pugin is clear at the corner, and William Chambers is presumably either the fifth or sixth figure to his left. The great 19th century advocate of the gothic style, Pugin stands, as Stamp and Amery suggest in Victorian Buildings of London, 1837-1887, with his back to all the others. Henry Purcell is lucky to have the corner, while five to the right a gaunt Ludwig nods his noble brow. Haydn seems to have had the good sense to sit down and read the paper. The sculptural groups at the corners represent the continents, in this case Asia, by J.H. Foley. The elephant says, "What foolery next?" Europe, by P. Macdowell. The choice of a representative animal must have been difficult, but perhaps the bullock represents strength and disciplined labor. America, by J. Bell. An Indian maiden in something French? Africa, by W. Theed. Pity he never got beyond Egypt. 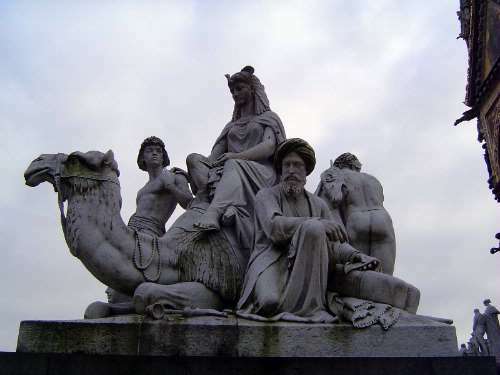 Scott was unhappy not only with the height of the fléche but with its sculptures. He wrote, "I must say of the latter that the models were much superior to the execution in metal" (p. 265). 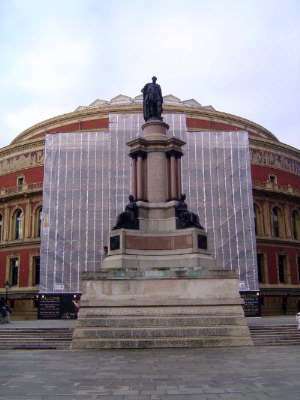 Prince Albert gazes across a very busy street and upon the Royal Albert Hall, which was designed by Captain Francis Fowke of the Royal Engineers and completed in 1871. Contrary to first impressions, the footprint is elliptical, not circular, with the greater axis perpendicular to the street. The walls are of brick with terra cotta decoration. The roof, steel-framed, is of wrought iron. 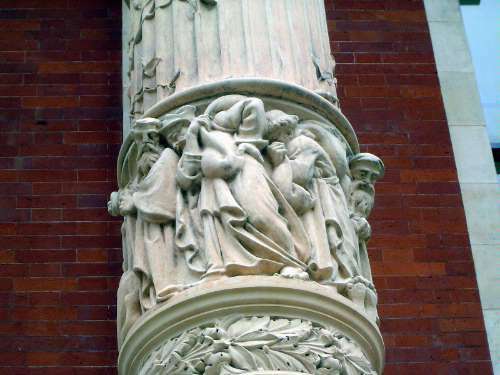 The mercilessly didactic frieze, more of the ever-earnest bildung that was part of the Albert package, depicts "The Triumph of Arts and Sciences." Pevsner grants the building "a clean, convincing simplicity" (3:489). He also notes that opinions in the 1880s ran the gamut from "a pile worthy of Rome in its palmiest days" to "on the familiar curves of the common bandstand." Stamp and Amery comment only that it is "very simple--if not crude and naive--compared with the contemporary Opéra in Paris" (p. 88). 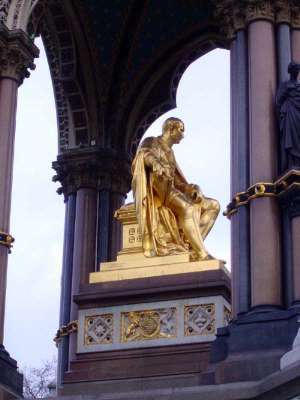 On the south side of the hall there is another figure of Albert, this time atop a memorial to the Exhibition. 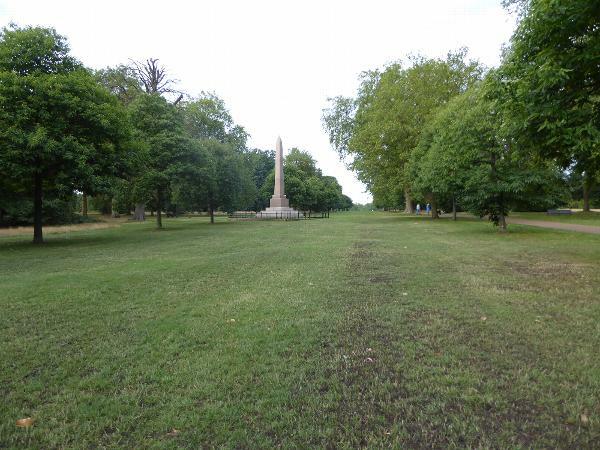 Designed by Joseph Durham, the monument was unveiled in 1863 at a different location and moved here in 1893. Here Albert wears black paint, perhaps because he was decent enough to have been embarrassed by the thing and sensibly preferred to spend the 6,000 pounds it cost on a museum of science and art. Once he was dead, his objections were forgotten. Asked to justify the Exhibition, the sponsors could have pointed, as they do at the top here, to the Book of Isaiah, 43:9. "Let all the nations be gathered together." Participants were neatly divided into British and Foreign, with the British on top. The Will to Explain here gets the better of the Virtue of Legibility. Six million visitors, receipts of half a million pounds, expenditures of 300,000 pounds, 14,000 exhibitors of whom the majority were British. Perhaps Napoleon was right in dismissing the British as a nation of shopkeepers. The prince in this case faces what was the Royal School of Mines. The busts are of the school's benefactors, Alfred Beit and Julius Wernher, both rich from South Africa. Beit was a founder of De Beers and an ally of Rhodes. Is the figure on the left digging for diamonds with his bare hands? Does the figure on the right, sword in hand, represent Europe in its role as master? Too bad we can't ask Ralph Montford, the sculptor. 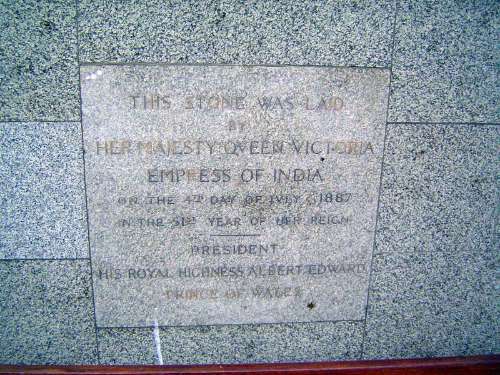 To mark Victoria's Golden Jubilee in 1887, a Colonial and Indian Exhibition was staged in 1886. Was it to be ephemeral? Tennyson, the poet laureate, hoped not. "Raise a stately memorial," he wrote, "Some Imperial Institute/ Rich in symbol and ornament/ Which may speak to the centuries." The result was the Imperial Institute of 1893, a massive building with a facade 700 feet long. 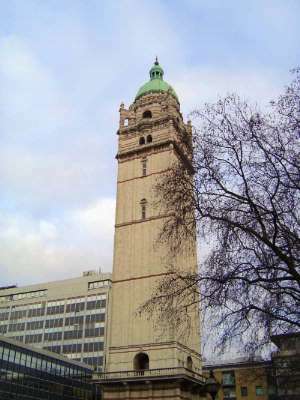 It was demolished in 1957, but this central tower survives as the Queen's Tower or Collcutt Tower after its designer. 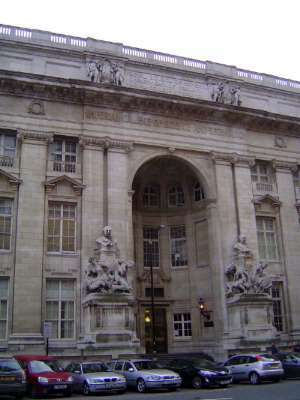 Imperial College today occupies the site of the Imperial Institute, while the Institute lives on under another name. From 1962 to 2002 it was the Commonwealth Institute; since then, it has been the Commonwealth Education Trust. The stone at the base of the tower. The subsequent growth of Imperial College says more than anyone intended about the withering of imperial pride. 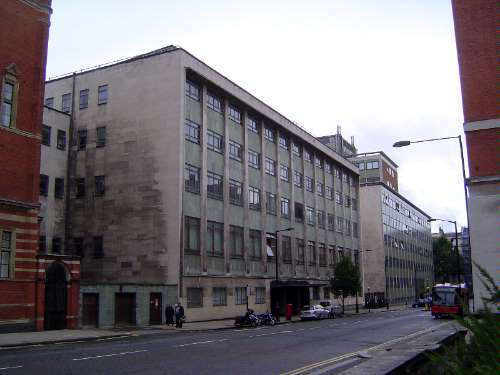 For lack of steel, construction of the Roderick Hill Building (Aeronautics) and the Blackett Laboratory (Physics and Biology) was delayed for several years after plans were complete in 1949. They didn't improve with age. 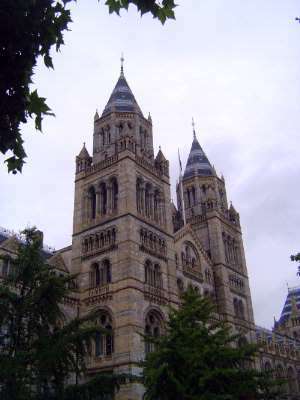 On the south side of Imperial College is the Natural History Museum, perhaps the grandest Romanesque building in London. 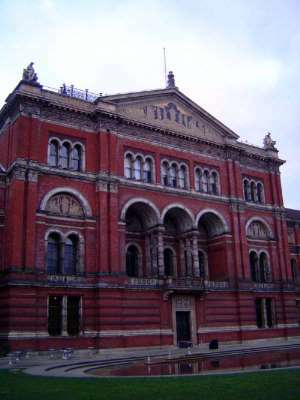 The site was acquired in 1864; plans was developed by Alfred Waterhouse; they were simplified (hard as that is to believe); and work began in 1872. The first part of the building opened in 1881. 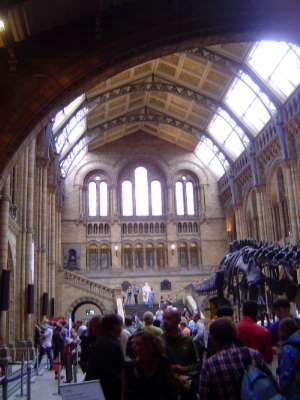 The entrance hall, still in terracotta, has a roof of iron and glass. The view from the entrance hall of the upper floors. 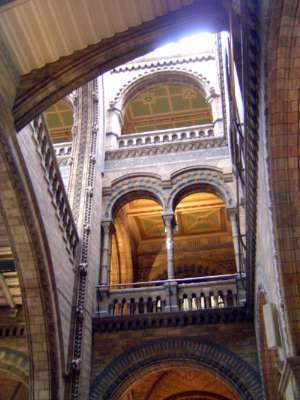 Monkeys climb the piers, consistent with the original intent of Richard Owen, the first superintendent of the museum, that "objects of natural history" should ornament the building. They're awfully well trained. 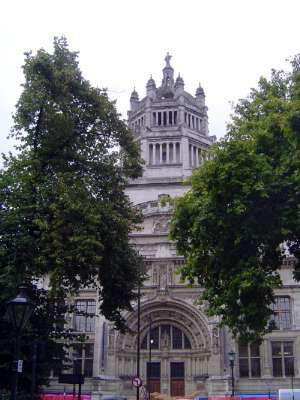 The Victoria and Albert Museum stands just to the north of the Natural History Museum but suffers by not being set back from Cromwell Road. 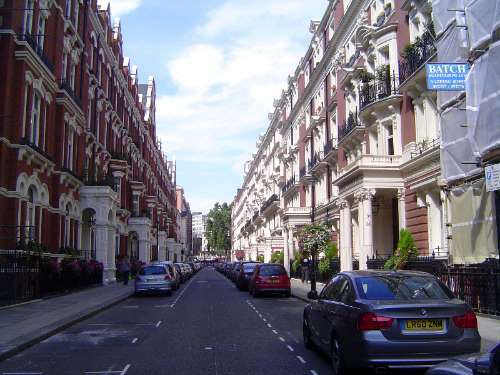 The architect was Aston Webb, who also did the none-too-admired facade of Buckingham Palace. The design here, Pevsner writes, has an "almost naughty looseness" (3:495). 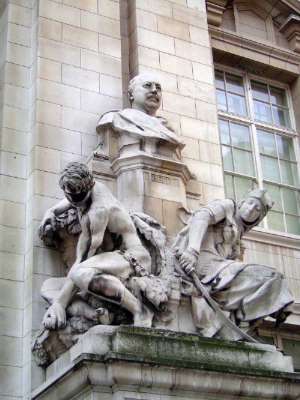 The decoration around the main entrance was by Alfred Drury and William Goscombe John. 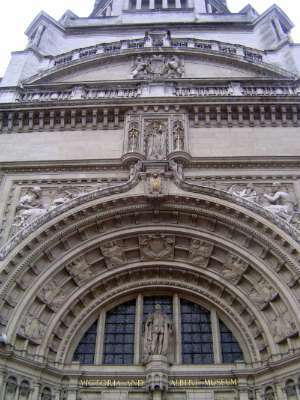 Albert stands above the entrance, dressed for an Elizabethan costume ball; the nine figures in the arch above him carry the museum's motto ("The excellence of every art must consist in the complete accomplishment of its purpose"). The figure in the left spandrel is Beauty, admiring herself in a mirror held by a boy; on the right, Truth admires a model of the V&A held up by a girl. 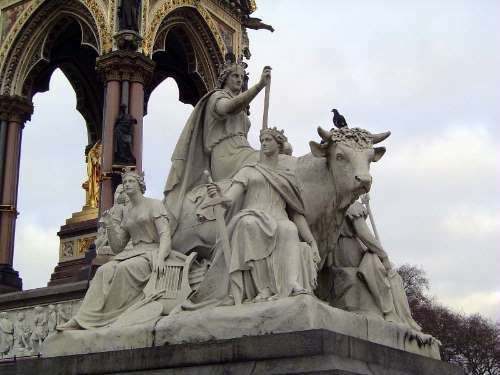 Above, Queen Victoria is guarded by St. George and St. Michael, swords in hand. 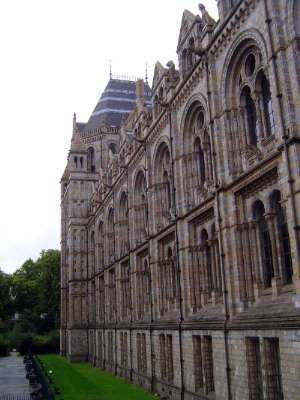 Behind the main building, a courtyard is framed on the north by what was originally the South Kensington Museum, from the 1860s. 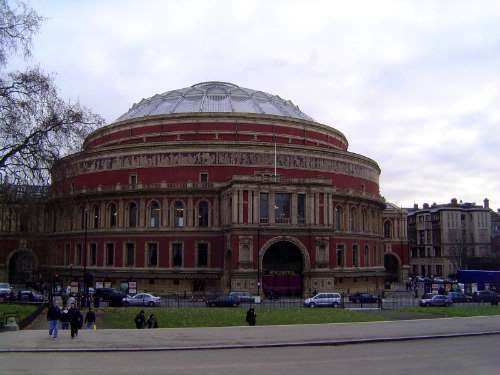 The architect, once again, was Captain Fowkes of the Royal Engineers, who also designed the Royal Albert Hall. Note the elaborate terracotta columns. 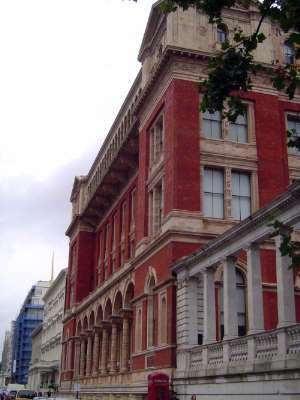 The Henry Cole Wing, completed in 1871, was the former School for Naval Architects. The projecting balcony or loggia was intended to let those students get some fresh air. Below: more terracotta columns. Nearer the camera: a screen by Aston Webb, designed to block a view of boilers and left pockmarked as a reminder of wartime bomb damage. 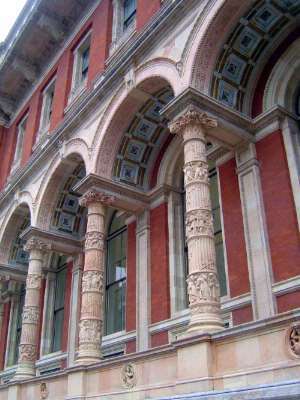 Columns of the Cole Wing. Terrace housing was built within the perimeter of Albertopolis to help pay for the public buildings and monuments.